We strive on a daily basis to ensure our customers’ total satisfaction. We do our utmost to offer customised, innovative solutions which meet their expectations. We have consequently adopted a signage management quality (SMQ) approach and introduced strict controls at all stages of the manufacturing process. We carry out regular internal & external quality audits of our production sites and products. We also audit our methods & procedures in order to ensure high quality standards as expected by our customers. Oeko-tex Oeko-tex Standard is a world-famous testing and certification system for textile raw materials, intermediate and end products at all stages of production. It excludes or strictly regulates, through laboratory testing, the use of substances potentially harmful to health. All our products are Oeko-Tex Standard 100 – class 1 certified. showing that our products have undergone rigorous testing and have complied with Oeko-Tex’s test criteria. A catalogue of criteria, comprising more than 100 different parameters, provides a scientifically sound basis for evaluating harmful substances, and is regularly updated in line with the latest regulations and clearly exceeds current legislation. Oeko-tex offers an additional level of quality control for INCH products, and guarantees the safety and reliability of our products for the consumer. Our two laboratories, working in partnership with Sioen Industries (a world leader in coating) conduct tests and inspections of materials and finished products, to ensure that they meet performance, quality and safety criteria: wash, waterproofing, breathability, durability, tear resistance tests, etc., in accordance with current standards. 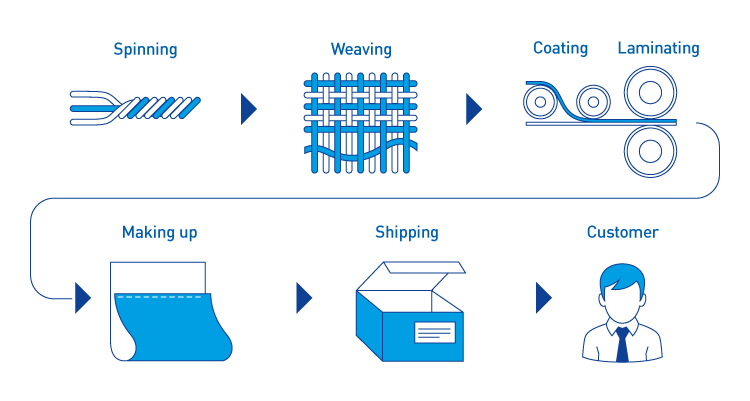 Une We have optimal traceability which provides, on an ongoing basis, information throughout the manufacturing process. This allows our processes to adapt quickly to change and offers greater transparency and improved customer protection.